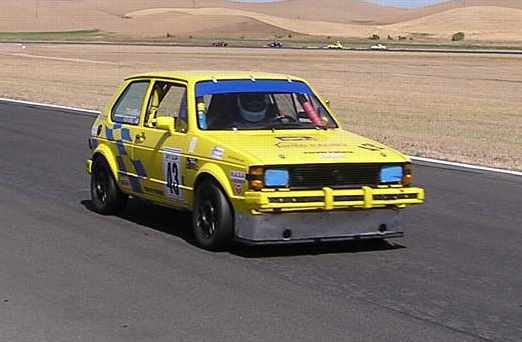 Shed Racing returned to Thunderhill Raceway Park, September 10-11 2005, to contest NASA's GTI Cup class. There were 5 cars in class Saturday and 6 Sunday. Tom Aiken drove Saturday, and Ron Swett Sunday. Other competitors included Scott Neville, Joe Craven, Don Bailey, Carlos Suarez, for the Saturday race, with Calvin Wan joined in for the Sunday race. 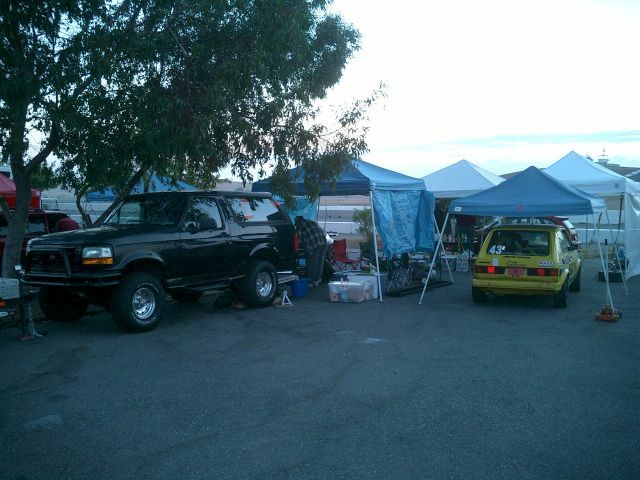 The RV wasn't available this weekend, so Ron's Bronco served as the transporter, and with Tom's 911 filling the support vehicle role. The Miller Motorsports guys yet again set up next to us in the paddock. 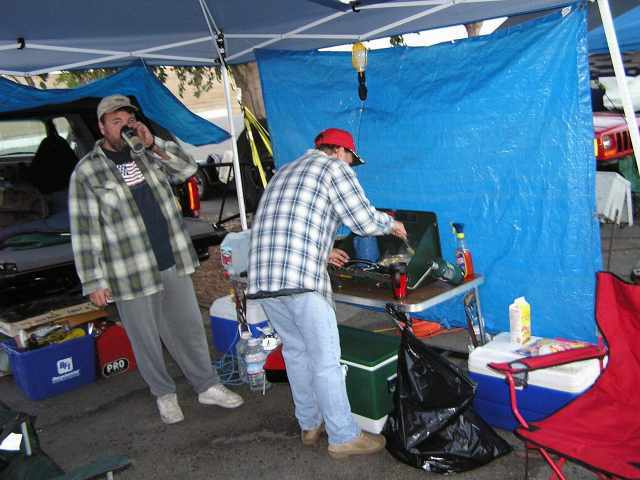 At the last event, Tom reported a metallic rub in the right front, but the problem could not be identified at the time. Ron discovered the source of the rubbing when he loaded the car on the trailer Thursday evening, as the brake rotor rubbing on the caliper mount, something that should not be possible. Unfortunately there wasn't time to determine the root cause, in advance. Procrastination strikes again. Exploratory surgery began not long after unloading the car at the track Friday afternoon, which turned out to be failed circlip on the inside of the right front bearing housing. The wheel bearings are pressed into the spindles, and a circlip keeps the bearing/hub assembly from moving inward. When the circlip popped out of it's groove, cornering forces allowed the bearing and hub to move inward slightly, causing the brake rotor to rub on the caliper mount. Tom and Ron installed the spare hub assembly. Ron whips up some breakfast before the Saturday morning warm-up. The Miller guys had problems from the start, with a leaking rear brake line discovered as the Pro-7 car was rolled off the trailer. Marcus immediately took off south for the 2 hour trip to get parts from Scott's house. They ended up missing the morning session, but got the car working in time for qualifying. The morning practice session was a combined with the Legends group, making the track very crowded. Tom got off to a good start on Saturday, with a best time in the morning warm up of 2:18.12, averaging 78.2 MPH for the lap, slightly faster than his previous best. 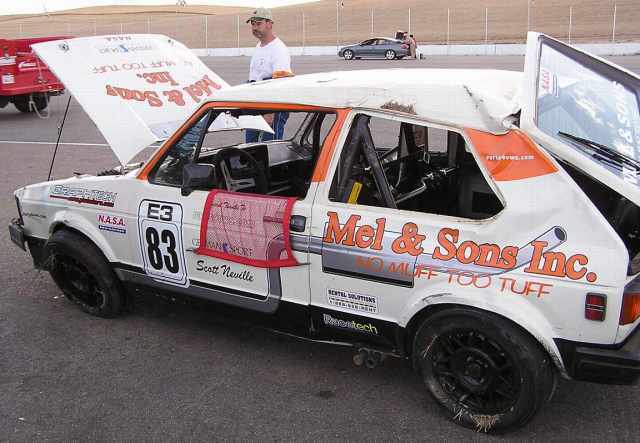 The race car had a pronounced understeer, it was very difficult to get to turn into the corners. Understeer is normal for a front wheel drive, heavily front weight biased car, but this was worse than normal. The rear tire pressures were increased to try to get the car to rotate a little easier for the qualifying session. 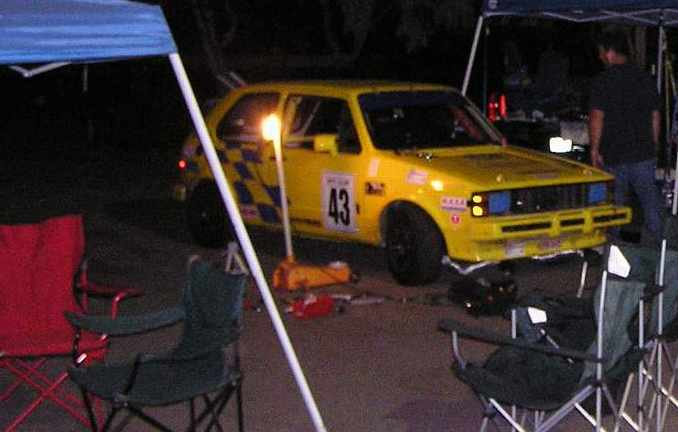 This was the first event at Thunderhill with the new stiffer suspension, and some setup refinement was expected. Scott Neville had the fastest time of the GTIs in the morning session, with a 2:15.4. The pressure adjustment didn't seem to help the handling, but Tom still managed to improve his time, dropping to 2:17.837 in the afternoon qualifying session. Joe Craven put himself in pole position with a 2:13.883, followed by Don, Scott, and Carlos and Tom. 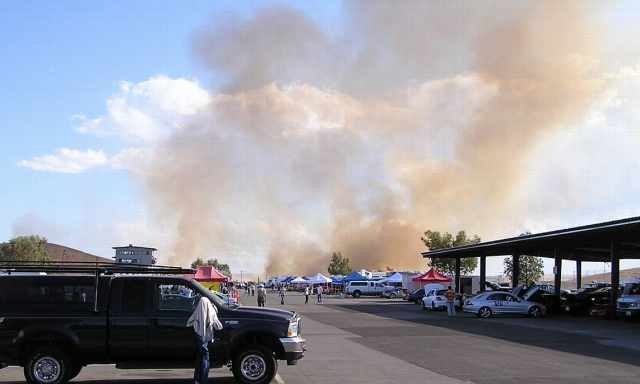 Early in the afternoon on Saturday, smoke started rising from the south of the track. 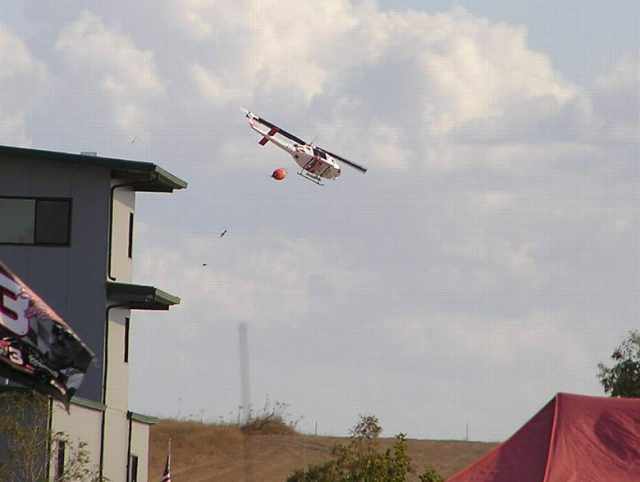 A grass fire had started in the field on the other side of the highway, outside the gates of the track. 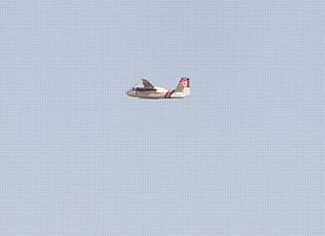 The track gates were closed for a time, while the California Dept of Forestry fire crews and aircraft fought the fire. Tom got a fair start in the Saturday race, falling back slightly from the rest of the group, but passing Scott Miller's RX-7 when he dropped 2 wheels off the outside in turn 2. Tom spent over a lap trying to pass Stephen Singley in the red PS2 class MR2. 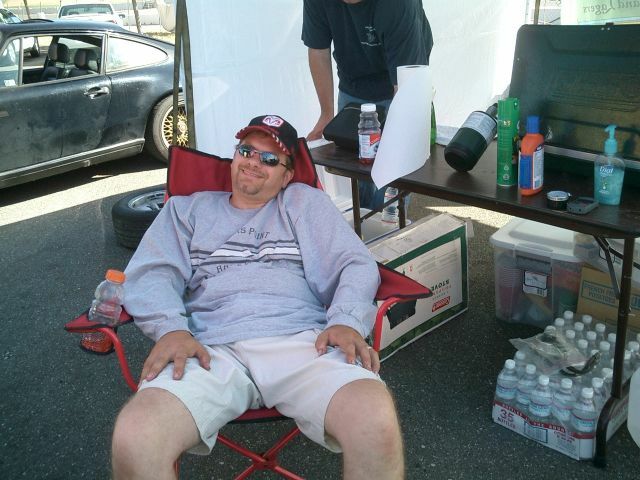 Stephen usually lets the rest of the GTI group get by without much trouble, but makes the Shed Racing guys earn it. Unfortunately by the time Tom made the pass on the front straight, the rest of the GTI field was 15 seconds ahead. Tom ran his fairly uneventful race, until Scott Miller caught back up and passed him in lap 5. The RX-7's lap times improved nicely over the qualifying session, and rapidly opened a gap over the Rabbit, which lasted for 2 laps, when Scott spun in turn 6. Tom held on to his position, for most of the remainder of the race, when Scott caught back up on the last corner of the last lap. The two cars drag raced to the finish line, where the higher power of the Mazda won out, with Scott crossing the stripe 1/100 of a second ahead of the VW. Tom on the front straight. After the race, Ron and Tom discovered the front wheel alignment had some toe in again. If this changed while the swapping the front spindle on Friday night, or as a result of over aggressive berm jumping is uncertain, but it does explain in part the understeer Tom was struggling with all day. Fixing the alignment, yet again. Dan Piña arrived Sunday morning, with Calvin Wan for the Sunday races. 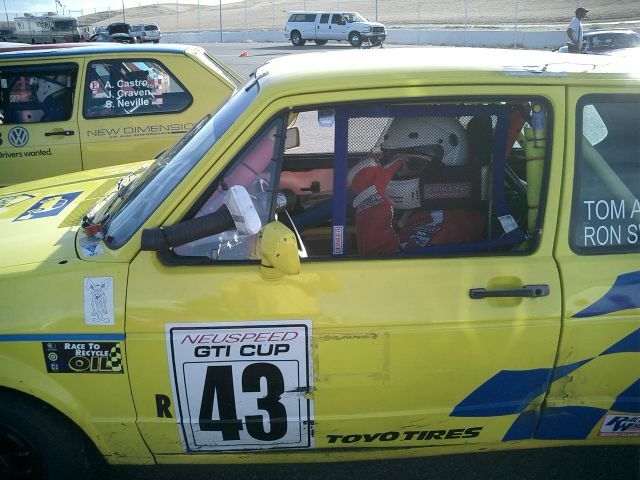 Calvin is trying to get his license finished and rookie races complete so he can compete in the NASA 25 hours of Thunderhill endurance race in December. Scott Neville leads Carlos Suarez, Kurt Frietzsche, and Calvin Wan down the front straight. Ron got things going quickly in the morning warmup session, with a 2:17.6 on his third lap out. He spent most of the session grouped with the other GTIs. Scott Neville had the best time of the morning session, with a 2:14.76. Once again, the Sunday qualifying was changed to a qualifying race, with the starting grid based on the finishing position of the Saturday points race. Calvin missed Saturday altogether, which put him on the pole, with Ron on the outside front row. Ron got an outstanding start when the green flag dropped, beating Calvin into the first turn. He held on to the lead most of thew first lap, when Carlos got inside of him going into turn 10. A slow shift hurt his momentum on the back straight allowed Don to pass him near the bridge, and Scott Neville to pass on the inside entering 14. Scott went into 14 a little hot, and ended up on the newly paved runoff area outside the turn, and Ron regained third position in class. He held onto third place until the end of lap 3, when Joe Craven made an outside pass setting up for turn 1. Ron hung on Joe's bumper until turn 6, where Joe carried a little more speed through the turn and onto the fast section beyond. Scott Neville got a good run through 6 as well, and his better exit speed got him inside and past Ron in the fast uphill Turn 8. Calvin had an electrical problem, forcing his retirement from the race. Carlos finished first, putting him on the pole for the points race. Don finished second, followed by Joe, Scott, Ron, and Calvin. Joe Craven had the best lap of the race, a 2:14.07. Ron's best time improved by over two full seconds, to 2:15.35, at 79.8 MPH. Trouble continued for the Miller guys, as Scott Miller's frequent abuse of the right side suspension took it's toll, and the front strut insert failed. 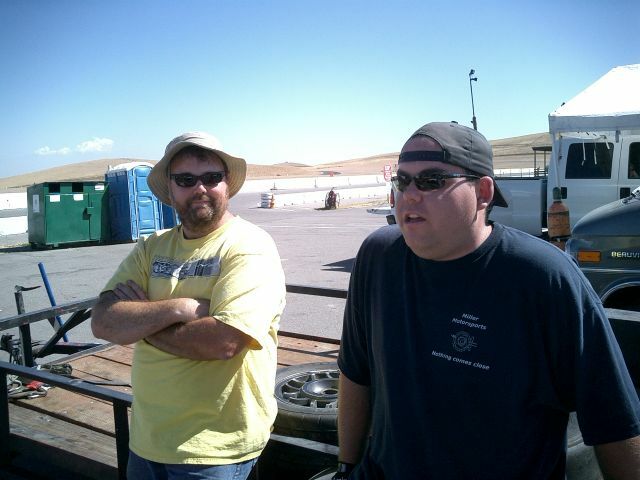 They thought they were done for the day, when Tom, (wearing his crew chief hat) suggested they try and borrow one from one of their competitors. Scott put his hat in his hands, donned his most pathetic face and wandered around the paddock, "Brother can you spare a strut?" Amazingly, he came back with one. Just to keep things interesting, it was an adjustable Koni brand, a very high quality unit. The strut on the left side was a Tokiko brand, which can best be described as "Inexpensive". The result of this combination is Scott had a car which turned left considerably better than it would turn right. Tom and Marcus wait for Scott to panhandle a strut insert. Ron on the grid for the Sunday Feature race. The start for the Sunday points race was clean, but things pretty much went to hell from that point on. Don won the drag race to turn 1, followed by Carlos and Joe. Ron passed Scott on the straight, and Calvin passed both Scott and Ron, into T1, only to be re-passed by Ron when he went wide coming out of the turn. This order held until Joe passed under Carlos entering turn 9. Scott tried to pass Ron on the inside between turns 14 and 15, and ended up launching off the new inside berm. Ron held his position, even after dropping 2 wheels off in the exit of 15. The following lap, a RX-7 driven by Kurt Frietzsche spun just after the turn 5 bypass, putting a dust cloud and a car in the middle of the track, right as Ron crested the blind hill over the bypass. Ron avoided the dark spot in the dirt cloud and continued to hold on to 4th place until the end of the lap, where Scott Neville tried to pass again on the inside between 14 and 15. This time Scott made it stick, moving Ron back into 5th. The next lap, Calvin dived under Ron entering turn 6, but lost his momentum in the process, and Ron regained the position in turn 8. Three turns later, the Spec Miata class (which started a half lap behind the GTI group) caught up and passed Ron coming out of the esses, and Calvin got by him as well. The dust clears from Kurt's spin, Ron leads Scott and Calvin into turn 6. The following lap, a white Miata went way off the track outside turn 6, which brought out a full course caution. The pace car was out for a lap and a half, just long enough to get the field bunched up for the restart. 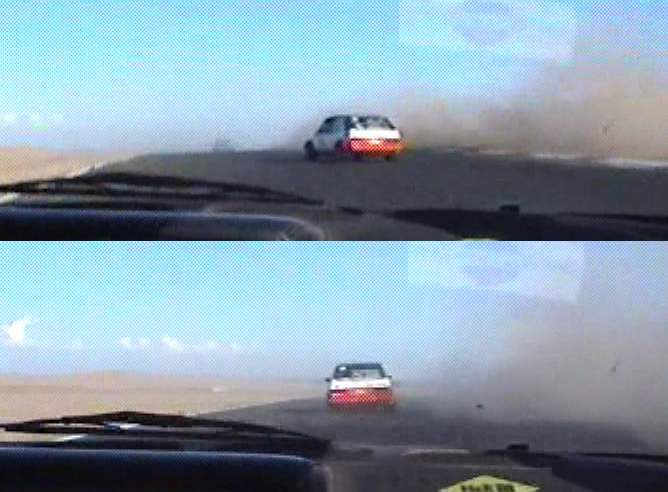 On the restart, the white Miata dive bombed inside Ron, nearly shoving him off the track outside turn 1. Ron closed with Calvin in the lap following the restart, but never got in a position to make a move. Entering turn one on the next lap, a Miata spun in turn one, causing another mid-track dust cloud, and Calvin to get a little sideways avoiding it. Calvin demonstrates car control at ~90 MPH. Later that lap, the same white Miata punted Don Bailey off the track, on the very fast uphill section near turn 8. Don went off the track sideways, the tires dug in the dirt, and Don rolled several times. He was unhurt, but the car is a total loss. Scott Neville looks at what is left of Don Bailey's car. After Don's wreck, Calvin opened a lead over Ron. The final few laps of the race involved an excellent battle for position between Ron and Scott Miller in his Pro-7 class RX-7. Ron was a little faster in the corners, but the Mazda was faster on the straights. They swapped positions a couple times each lap for 3 laps, with the Mazda opening an insurmountable lead after a Miata got between them on the white flag lap. Joe Craven won the class, with a best time of 2:13.646, followed by Scott Neville, Carlos Suarez, and Calvin Wan. Ron's best lap slipped a bit from the qualifying race, at 2:17.885.